If you haven't received the most recent edition of Legacies in the mail, it's because we don't have a correct address for you. We'd love to be in touch, please email lperry@syrdiocese.org with your current address. 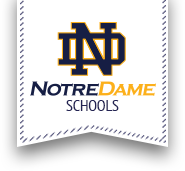 We look forward to hearing from you and sharing all the news of Notre Dame!